The Book Club in a Bag service provides area book clubs with thought-provoking titles that are sure to create an engaging book club discussion. All bags come with book club questions, 10 copies of the title and, in some cases, include a large print and/or audiobook as well. 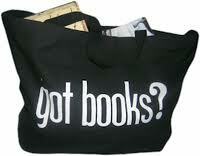 Click on the title to see summaries, reviews and what is in the bag. Call your local branch to reserve a title for your club.